Will Hamilton return to the same Bulls team? Great players don’t always make potential game winning shots. But they take them, which is what Derrick Rose did Wednesday in Milwaukee, and his step back jumper settled through the net as time expired for a 106-104 Bulls victory. Great players take those shots not because they want to be heroes and not because they are selfish and not because they don’t know the right basketball play. They take those shots because they are supposed to. It’s a sport and a game, after all, and they are the entertainment. But more than that, they take those shots so their lesser talented teammates do not have the face the pressure and the scrutiny. They take those shots because they have the most talent. They take those shots because that is their role. The role of their teammates, as Joakim Noah has said, is to go to the boards in case they miss. They take those shots and draw extra attention, which opens up their teammates for offensive rebounds and opportunities to help the team win the game. They take those shots the same as you want Albert Pujols up with the bases loaded or Tom Brady with the two minute drive. The best and most talented players have a responsibility to the game and to the community, and Rose in Milwaukee Wednesday again showed why. “My teammates give me a lot of confidence,” said Rose, who scored, assisted or took the shot that led to an offensive rebound score on the Bulls last 13 points after the Bucks took a 95-93 lead with 3:46 left. “They tell me to take the last shot. I wanted to go around five (seconds left) or four so there was no time left on the clock. I’m certain Bucks coach Scott Skiles meant no offense to Bulls coach Tom Thibodeau in Skiles’ post game comments. As an aside, the Bulls owe Skiles a huge debt of gratitude. It was his falling out with the team that led to his firing on Christmas Eve 2007. That sent a Bulls team believing it could compete for a top four playoff spot into the lottery. The Bulls then jumped up to No. 1 to draft Rose, who saved the franchise. Obviously, Rose’s game winner is the story for the 33-8 Bulls, winners of 15 of 17 and eight straight despite Wednesday playing without injured Richard Hamilton and C.J. Watson. But the last shot has become an intriguing debate recently, mostly because of the reluctance of LeBron James, considered by many the front runner for MVP this season, to take that kind of shot. James generally passes the ball to an open teammate, though Wednesday night with the Heat needing to make plays to beat Atlanta down the stretch they put the ball in the hands of Dwyane Wade and made James a decoy. But Thibodeau later went on to say when asked whether he was surprised the Bucks didn’t double team Rose to take the ball out of his hands (I was), that it is the responsibility of the “primary scorer” to make the correct play. It’s obviously a judgment, and there were years when Michael Jordan was getting triple teamed by the Pistons that he and the team were failing regularly. Jordan had to learn to make the pass at times, and Rose has done that. He’ll give up the ball. On that play, the Bulls had their best scorers on the floor, though they are players without much of that sort of experience. The Bucks stayed close with Kyle Korver to Rose’s right in the corner. But Carlos Delfino was hedging toward Rose off Luol Deng on the left wing. That Deng already had a pair of threes probably helped keep Delfino honest, though Deng was fairly open as Rose made his move and had his hands up for a pass. Luol Deng on the left wing for a long three or Rose into traffic in the middle? I’ll take Rose. Win or lose. No offense. That’s also the point. I want my best player who has the best chance of getting a foul call and with the most experience in these situations taking that shot. When you are that player, as guys like Jordan understood, it’s not only so much getting the attention but taking the pressure off others and putting it where it should be. With excess defensive pressure, sure, give it up. But without that it’s your shot and your responsibility, and Rose understands that. Which is why the Bulls have a greater chance than the sum of their talent. There’s much debate about this lately given increasing talk of who is the MVP. Or what is an MVP? Is it the most outstanding player, which probably is James. Most valuable to his team? Rose? Kevin Durant? I don’t know how you can be MVP if you don’t take that responsibility for your team. And given the choice of the pass or shot, I say, Shoot, Derrick shoot. See Derrick shoot. It was a special moment, which really is what sport is about. Joakim Noah continued his exceptional play with 20 points, 10 rebounds and two blocks, grabbing several offensive rebounds over the heads of Bucks interior players. Taj Gibson also was good with 10 points, seven rebounds and two blocks in just under 20 minutes, and several saves of balls rolling around on the floor. Also, Omer Asik was vital on defense to open the second quarter when the Bulls first began to get some separation to take a 41-32 lead after it was 33-30 Bulls after one. It’s also why it would be a mistake to trade any of them while Richard Hamilton is out with his shoulder injury. C.J. Watson will probably be out until next week with his sprained ankle, but Hamilton said before Wednesday’s game he cannot lift his arm and not to expect miracles. I’m thinking that gets Hamilton back before Easter Sunday, though not all that much sooner. Still, the Bulls’ size was vital in holding off the Bucks, who did play small with center Andrew Bogut out for the season. But their quickness and perimeter shooting did bother the Bulls with Ersan Ilyasova getting 32 points and 10 rebounds and former Bull (and most everyone else) Drew Gooden with 27 points. Thibodeau afterward was upset with the Bulls defense that gave up almost 48 percent shooting and couldn’t hold off the Bucks down the stretch after the Bulls took a 102-97 lead with 1:54 left. They are well coached. Thibodeau was mentored in the Jeff Van Gundy school of every coach is a great coach and it is organizations that lose championships. Which I think does a disservice to the really good coaches, of whom Skiles is one. Skiles grew up in Plymouth, Ind., where I know they teach readin’, writin’ and rithmetic. But he is one of the best coaches I’ve ever watched at geometry. Most sports are about angles, and Skiles is excellent at creating angles of attack for his offense. So why are the Bucks 15-24, you may ask? Acting as closer again was Brandon Jennings, who lobbed up a nice four of 18. The difference between lottery and low playoff teams or mediocre and excellent teams is usually a good finisher. The Bucks don’t really have anywhere to go with the ball to create an individual shot or play. The Bulls at least have one. That Miami has two — one and a half? Two and a quarter? — is why they’re so celebrated. It does make a difference. I didn’t think the Bulls defense was so bad. I thought it was more Skiles is adept at creating angles of attack, moving his screens so his players will get driving lanes. It’s why the Bucks had 52 points in the paint, rare against the Bulls, and why they were able to make key late plays in getting down the lane and getting fouled or with Ilyasova getting clear for a putback after a Jennings’ driving miss with 24.9 seconds left. With Noah and Gibson going for the ball, Ilyasova was able to sneak in behind before Ronnie Brewer could close him off to tie the game at 104 with 24 seconds left. One possession for the game or overtime, right? The Bucks chose not to trap to force Rose to pass, which will be second guessed. But the Bulls did make it difficult by spreading the court. Last season in the playoffs against Indiana in Game 3, there was a similar situation and the Bulls ran more the so called one/four flat isolation without someone to set a pick. It was similar this time, which makes it more difficult to defend Rose. The Bulls in the playoffs with Boston in 2009 kept getting beaten with Paul Pierce running that. If you do double at that point, you can leave lanes to the basket wide open. And the Bucks don’t have shotblockers without Bogut unless they use backup Larry Saunders. Plus, it’s difficult to sustain a double for that long and you’d assume the Bulls would have options for Rose to get the ball back with the defense then left scrambling. Skiles chose to set his defense. Rose dribbled the ball into the front court and took a timeout with 18.1 seconds remaining. Rose popped out from the inbounds stack and took a pass from Deng. Rose dribbled in the center of the floor guarded by Jennings. Deng went to the left wing above the three point line, where it would be a long shot. Korver ran to the right baseline corner. Delfino got into a defensive stance in the middle playing a zone. Noah and Carlos Boozer were along the lane on the left side giving Rose a right side lane to the basket. The play appeared to be for Rose to drive for floater and then if they all came perhaps find Korver in the right corner. But Jennings played to Rose’s right hand with Ilyasova stepping up from behind. Rose tried a crossover dribble, but couldn’t shake Jennings and went back to his left where Delfino was coming to the middle. So what is in your mind then as the scorer? It really is pretty remarkable to process that with time ticking down so quickly. “It’s knowing what they’ll give you,” Rose explained. “The last couple of end game shots were floaters. It seemed like he (Jennings) was backing up a little bit. And I just pulled up. 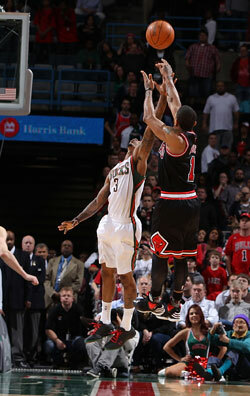 Rose crossed Jennings once more, forcing Jennings to go right briefly. Rose then went left with a jump stop and shot fading back, Jennings by now getting up pretty good on Rose’s right hand. Rose extended getting up high and then faded back, landing on his left foot as the 20 footer swished through the net for the win as the buzzer sounded to end the game. Rose was already backpeddling as the ball was in the air. It’s not usual for him as Rose rarely shows much emotion, but Rose pounded his chest with both hands and made a Kobe sort of mean face, which wasn’t very scary. Rose’s teammates swarmed him and Rose then walked off with the another day at the office look. According to Jeff Mangurten, the Bulls radio stat maven, that was the fourth time in six tries this season Rose has scored with the game tied or the Bulls down three or fewer in the last 30 seconds. In his career, Rose is 13 for 46 in those situations. “We’ve been in that situation time and again and he makes them pay time and again,” said Boozer. “Heck of a shot, step back jumper, fading, couple of guys flying at him. Nothing but net. Amazing. It was the stuff of drama and Noah agreed. It was a unique game for the Bulls given the Bucks interior players coming out shooting jumpers. Gooden had 16 points in the first quarter, primarily from outside as Boozer and then Noah took turns on him. But Rose got a dozen and the Bulls shot almost 70 percent to take a three-point lead. You could see Rose was lively as twice on drives the Bucks stepped in to draw changes and Rose changed direction, going sideways and up for scores. Noah also had a slam dunk on a pick and roll with Rose, finishing strong in the half court, which he often doesn’t do. And later Gibson would have a lob slam dunk, which the Bulls also don’t do much of, on a pass form John Lucas. The Bulls took a 55-50 halftime lead, but the Bucks began to pressure more and the Bulls did begin committing more turnovers after halftime. With Ilyasova finding alleys, the Bucks were able to pull into a 73-73 tie at the end of the third quarter. “We turned it over because of what they were doing,” agreed Thibodeau. Though not big, the Bucks are quick to the boards and had 16 offensive rebounds, their 19th consecutive game with double figure offensive rebounds. It would be a wild, high scoring, multiple lead change fourth quarter. The Bucks finally punched ahead 83-82 with 8:17 left on two Mike Dunleavy free throws. The Bulls were holding them off with some nice contributions from the reserves with threes from Lucas and Korver and a nice deep post catch and score from Asik. Still, the Bulls could not shake the Bucks, and the Milwaukee seemed to take control with Jennings and Ilyasova threes for a 93-91 Bucks lead with 4:07 left. It was then Rose basically made every play for the Bulls. He got fouled on a loose ball and made both to tie the game. Ilyasova then was fouled on a nice pick and roll and made both for a 95-93 lead. Rose then converted a wild pass to Deng as Rose stumbled on a drive and Deng hit a 16 footer to tie the game at 95 with 3:31 left. After Jennings missed, Rose drove. He drew the defense and Noah diving in converted the miss for a 97-95 Bulls lead. Rose then ran out for a score after another Jennings miss, and the Bulls seemed in good shape up five after Gooden’s jumper was matched by a Deng three. Beno Udrih got an offensive rebound on a scramble and was fouled, making one. Rose then missed a three and Udrih was fouled again and made both to bring Milwaukee within 102-100 with 1:06 left. Rose drove and it appeared Jennings grabbed his arm, though there was no call. Rose’s arm directed the ball out of bounds, and Milwaukee took possession. Udrih, who had 11, made a tough spinning drive as the defense didn’t go hard enough to his left hand as he is a lefty. That tied the game at 102 with 42.9 left. That sort of silenced the crowd, which was very pro Bulls as Bulls fans buy up most of the seats at Bucks games. It was so wild the game started with fans chanting “defense” when the Bucks had the ball. The Bucks fans there were chanting “overrated” at Rose early, though that would change. “We didn’t let the crowd get to us at all,” said Jennings in something you rarely hear from the home team. Rose then drove into the paint and faded back and was hit by Jennings for two free throws. Rose made them both for a 104-102 lead with 32.5 seconds left, which he said pleased him perhaps even more than the game winner given his misses in Miami in January when the Bulls might have won. But then came Ilyasova’s follow to set the stage for Rose’s final act.